Looking for an SUV with a spacious third row, great horsepower and impressive towing capacity? 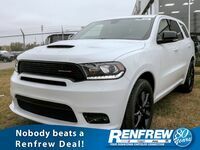 Look no further than the 2018 Dodge Durango in Calgary, AB. As one of the most powerful vehicles in the SUV class, the 2018 Dodge Durango is reliable and capable. And with a maximum cargo capacity of 84.5 cubic feet, there’s more than enough room to store anything you need to bring with you for your travels. The 2018 Dodge Durango is offered in five trim levels: SXT, GT, Citadel, R/T and SRT. All models except for the SRT are rear-wheel drive as a standard, with all-wheel drive being available as an option. The SRT is only available with all-wheel drive. The 2018 Dodge Durango is available in ten exterior color options, with three interior color options offered as well. Standard features include heated mirrors, a rearview camera, keyless ignition and entry, three-zone climate control and Apple CarPlay/Android Auto support. There are three engine options for the 2018 Dodge Durango. This SUV comes standard with a 3.6-liter V6 engine which generates 293 horsepower and 260 pound-feet of torque, paired with an eight-speed automatic transmission. The optional Blacktop package improves performance further, giving the engine 295 horsepower and 260 pound-feet of torque. Available for the Citadel trim and standard for R/T models is a 5.7-liter V8 engine with 360 horsepower and 390 pound-feet of torque. The SRT trim, new for the 2018 model year, features a 6.4-liter V8 engine with an impressive 475 horsepower and 470 pound-feet of torque. 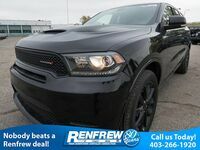 2018 Dodge Durango safety features include: Rear door child safety locks, turn signal mirrors, stability control, a remote anti-theft alarm system, traction control, child seat anchors, emergency braking assistance, an engine immobilizer and tire pressure monitoring.